Citizens are uniting in efforts to halt CPS’ spending for more nuclear reactors. 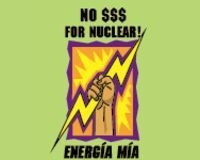 Speakers from many diverse organizations and businesses relayed their concerns about nuclear power as part of the newly formed Energia Mia network and are working to increase visibility and awareness of the problems of nuclear power. …the Southwest Workers Union, Project Verde, Alamo Group of the Sierra Club, Highland Hills Neighborhood Association, Jefferson Heights Neighborhood Association, Texas Drought Project, Green Party and the San Antonio Area Progressive Action Coalition. Alongside fundamental concerns about water, security, radioactive waste, and health and safety risks, the group is concerned about the financial effect the project could have on the city and the rate hikes that CPS has said will accompany STP’s expansion. CPS has already said that 5-8% rate hikes will be needed every two years for the next ten years to pay for this project, and that electric rates could increase nearly 50% as a result. The good news is that all the noise these activists are making is starting to have an impact. Already, Mayor Julian Castro is having doubts. And apparently, “at every public meeting, city and CPS officials have run into a buzz saw of objections from ratepayers and business owners concerned about higher energy costs.” Some folks are even calling for a referendum on the issue — or at the very least, an honest debate and presentation of viable alternatives (that won’t cost $100 dollars a head). Way to rouse that rabble, San Antonio. You deserve answers, and for your concerns to be heard in a meaningful way. If you agree with these folks (and if you’re a regular reader I bet you do! ), sign their petition!